If you are in IT, you will have been exposed to the topics of high availability and disaster recovery on more than one occasion. Both of these concepts are elements of business continuity, and are required to keep businesses moving forward. Every minute of downtime can equate to a massive loss in revenue for a company – this explains why most CIO’s identify business continuity as one of the highest technology priorities in 2018. According to the IDG CIO tech poll, even IT leaders anticipate business continuity spending to have one of the greatest budget increases of this year! What most IT organizations struggle with is how to effectively identify and adopt technologies that can help them meet the business continuity initiatives set forth by IT leadership. First, it is important to determine what systems are critical to the business, and from there an organization has to determine how available a system needs to be. This will likely dictate how highly available systems must be architected to meet the needs of the business. And as a part of the architectural design, it is important to determine how a recovery can be achieved in the event of a disaster happening, whether it be human error related or natural disaster related. But, what do high availability and disaster recovery really mean? According to TechTarget, “high availability refers to a system or component that is continuously operational for a desirably long length of time.” For storage, this could mean something as simple as configuring several disks as a RAID or it could mean multiple redundant storage systems and servers, configured to deliver consistent and ongoing uptime. For a solution to actually be considered highly available it must be capable of sustaining failures at different levels of the solution. This includes, but is not limited to, internal hardware, software and connectivity. Should a system actually fail, it is often important for an organization to quickly recover from the event – and this is where the concept of disaster recovery comes into play. TechTarget defines disaster recovery as a plan which “allows an organization to maintain or quickly resume mission-critical functions following a disaster.” To be able to recover from a disastrous event, IT organizations require features that enable data backup or automate the restoring of an environment, while incurring minimal downtime. This allows organizations to maintain the necessary levels of productivity. 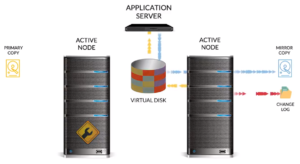 High availability and disaster recovery are not necessarily mutually exclusive. In fact, they are both important in delivering constant levels of business productivity. When both concepts are applied in concert, they can help organizations achieve extremely high levels of fault tolerance. A perfect example of this is when a system is disrupted and all of the communication can be instantly redirected to another available node within the solution, as pictured above. When the disruption is resolved, the system can benefit from automatic failover to the primary node in the solution. This results in maximum availability for business critical solutions, and more importantly, no disruption to end users. To discover more about how these elements of business continuity – high availability and disaster recovery – can improve your data center with the power of software-defined storage (SDS), just download a FREE 30-day trial or a live demo and one of our Solutions Architects would be happy to help!